A journeyman who is well regarded by his peers but seldom acknowledged by critics or the listening public, Leroy Williams has played in the bands of many of the jazz giants who came to prominence during the mid-to-late twentieth century. Despite high profile work with Sonny Rollins, Thelonious Monk, and Stan Getz, over thirty years in the company of Barry Harris, plus dozens of interesting recording dates, Williams' self-effacing artistry often goes unnoticed. A smart, unobtrusive stylist in the bebop mode, he shuns gratuitous displays of technique, and often doesn't make an impact on an ensemble in obvious ways. 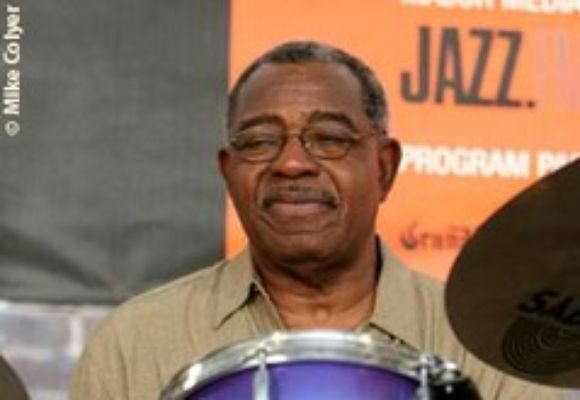 Reminiscent of Max Roach, Art Blakey, and Philly Joe Jones, Williams listens and relates to everyone on the bandstand. His timekeeping is reliable, and his sticking (particularly at medium and up tempos) is decisive and well defined. However, in contrast to his extroverted colleagues, Williams doesn't attempt to define or control the course of the music. Even though his drumming has a distinct identity, he consistently assumes a supportive role. (Jody Sandhaus, Winter Moon, Saranac Records) barely registers in the listener's consciousness; nonetheless, the track would be incomplete without them. A couple of fleeting exceptions to Williams' faint caressing of Sandhaus' voice include the rustle of a number of eighth notes to the snare that signal the onset of Pete Malinverni's solo; and eighth-note triplets to a muffled bass drum enhance the climax of the pianist's turn. section, at first his bass drum foreshadows, then is struck in unison with Hammer's accented, off of the pulse chords. This maneuver is both simple and very effective, tastefully retarding the music's steady, forward motion. Even more impressive is that each time the section is repeated, Williams modifies the quantity and exact placement of the rhythm. The listener anticipates yet is still left guessing as to when and where the stout thumps will fall. (Jody Sandhaus, I Think Of You, Consolidated Artists Productions), snapping in response to both individual words and phrases. Then, in conjunction with a barely audible ride cymbal rhythm, the terse crack of the stick on the snare prods Pete Malinverni's piano solo. Less interactive and more commanding than the brushwork, each punchy, perfectly placed stroke makes the music crackle with energy. (Tardo Hammer, Somethin' Special, Sharp Nine Records). His support of Hammer is remarkable for its variety and discretion. Because the steady pulse of the ride cymbal stays far in the background, and the firm clap of the hi-hat on beats 2 and 4 is not always apparent, the most important thing is the manner in which he constantly changes the emphasis of accents to the snare, tom-toms, and bass. Williams' sticking on the snare drum ranges from light taps to a sound like an ax splitting a log. Concise patterns to the tom-toms come off as melodic fragments. Sometimes bass drum figures stand alone, and extend beyond the expected length. Throughout all of these devices, Williams seldom plays at exactly the same dynamic level for more than a bar or two. Crescendos are sometimes built-in to a single measure. In some instances his rapport with Hammer results in their playing phrases almost in unison; in others, when the pianist leaves open space, the drummer's figures briefly stand out, yet do not detract from Hammer's next segment. And just when the accents begin to feel too frequent and dense, Williams always backs off for a few measures. (Tardo Hammer, Hammer Time, Sharp Nine Records). In both instances, the ride cymbal is a constant, steady presence; yet, once again, it's the jabs to the snare and bass drums that make the music jump. Williams swings intensely, but never sounds forced, awkward, or out of control. He occasionally integrates practiced, call-and-response patterns between the snare, bass, and tom-toms, but for the most part Williams catches Hammer's phrasing and inflections on the fly, and without fail immediately bends them into a related shape or form. There's a genuine economy to his drumming; everything is purely functional. While certain motifs are repeated often enough to become familiarstriking the bass drum on beats 1 and 4 of a measure, for exampleWilliams' brilliance lies in the constant reshuffling of a finite number of rhythms, and making them sound fresh and vital all of the time.